Elijah and Ava never had any trouble communicating between the sheets. It was outside the bedroom where the difficulties began. The pampered, only child of wealthy, controlling parents, Ava was not prepared to be the wife of a Navy SEAL. In truth, she never tried to be, letting her fear and her mother's continual attempts to sabotage her marriage to Elijah rule her. When tragedy struck, instead of turning to her husband in their shared grief, Ava ran - from her pain, from her fear, and from her husband. Four years later, Ava may think she has her life together but until she faces the pain, loss, and fear that ended her marriage, she'll never be whole or completely happy. Elijah Prescott is one of the good guys, putting his life on the line for his country and his SEAL teammates. He's moved on from the divorce he never wanted but he's never forgotten - or stopped yearning for - the only woman he's ever loved. Recovering from a serious injury in a mission gone wrong, Elijah has been cleared physically to return to duty. But the emotional scars of being betrayed by a friend and teammate who is still on the loose are slower to heal. A three-week leave sends Elijah to his cousin's gym in Napa and, unexpectedly, straight into the arms of his ex-wife. Will this be the second chance they need to right the wrongs of the past and move forward together or clear one another out of their systems for good? 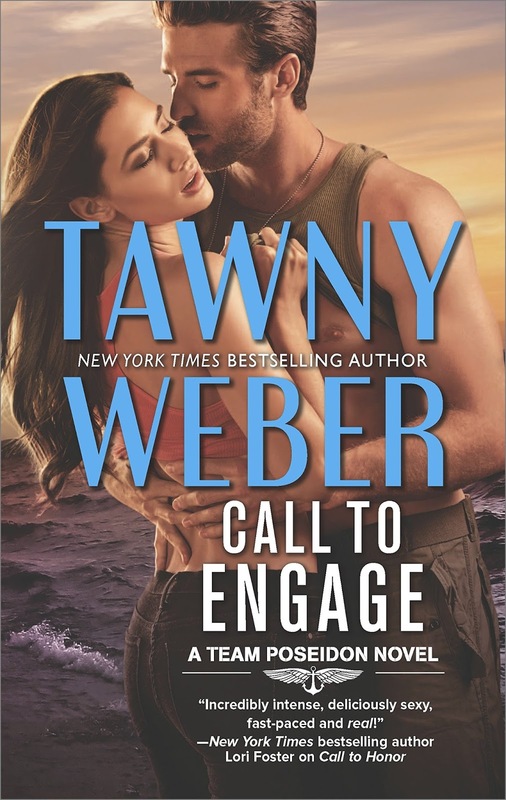 Call to Engage packs sizzle, action, suspense, and a deep emotional punch into a story that kept me invested in these characters and their journey from beginning to end. Weber takes time with both Elijah and Ava, not focusing only on the off-the-charts sizzle between them (though I thoroughly enjoyed the sizzle!) but slowly unveiling the emotional minefields that undermined their marriage. Ava, in particular, has years of issues to confront before she will ever be wholly happy, whether with Elijah or on her own. Weber handles those issues with compassion in some cases, tough love in others, and no easy fixes, grounding her characters in the reality of grief, emotional upheaval, fear, desire, hope, acceptance, and love that many readers have faced and to which we can relate. Add in a traitor on the loose, a team of hard-bodied SEALS, and a life or death race to protect a child and you have another satisfying, heart-grabbing, breath-stealing winner from Tawny Weber. Though I had no trouble reading this book as a standalone, there are events that occur in book one, Call to Honor, which I believe would have made reading Call to Engage an even richer experience had I read them in order. I'm already looking forward to the next Team Poseidon book, Call to Redemption, scheduled for release on October 31. Do you enjoy military romance? 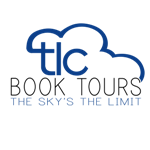 Have you read Tawny Weber's books? Are you reading the Team Poseidon books? Any secondary characters calling to you for a book of their own? I love military romance. Thanks for the chance. I have not read any of Tawny's books. And I do love military romance. I do like military romances because I admire men and women who are in the military. I have read a few of Tawny's books, but it has been a while. I love a good military book. I have read several of her books. I haven't started her new series yet.Put on my wish list. I do love reading military romance stories. I'm not sure if I've read Tawny's books but know I own a few. 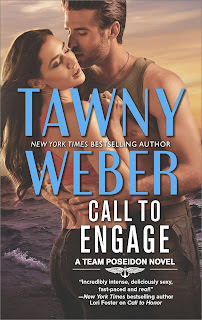 Tawny Weber is a favorite when I look for military romance. I have not started the Team Poseidon series yet but look forward to doing so. With any series, I like to start from the beginning and read them in order. For a relatively short series, I will get the books but wait until I have the complete series before reading them. The overall continuity of the series and characters is much stronger. I find I enjoy the series best when read that way. I I've Military romance. Yes, I have read and enjoyed Tawny's books. I haven't read the new series yet. I do like Military Romance but have not read any of Tawyn's books. Military romance is wonderful and meaningful. I haven't read any of Tawny's books but would love to. Thanks. I haven't read any of Tawny's books yet, but I do have one in my TBR pile.